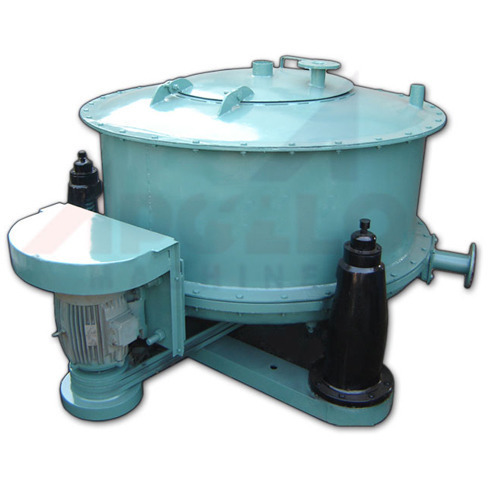 We are offeringManual Top Discharge Centrifugewhich is developed with the latest technology to our client. The three point suspended -manual top discharge- MTD model is an universal centrifuge for all application of solid-liquid separation by filtration. Offered in a variety of materials of construction like-austenitic steels, PVDF coated-mild steels etc. They are manufactured with the best technology in the field and gives long trouble free operational life. These are offered in various models like. Established in the year 2006, we are a well-renowned name in the field of Manufacturing and Exporting the comprehensive array of Pusher Centrifuge Machine, Horizontal Peeler Centrifuge, Bag Lifting Centrifuge, Bottom Discharge Centrifuge, Top Discharge Centrifuge, Curd Separator, Vertical Centrifuge Machine, Basket Centrifuge, Hydro Extractor Machine and many more. We are appreciated for unmatched quality, reasonable prices, timely delivery, and highly efficient, durable and economical products. Our robust infrastructure is the asset of our company which is equipped with ultra modern machinery and assisted by excellent manpower to manufacture unmatched centrifuges required for various applications. Conscious of quality, our quality department makes sure that not even a single products fall of quality parameters. Our quality management program comprises of strict inspection procedures that ensure error-free production from every level. Moreover, random inspections are conducted on the regular basis that invalidates every possibility of quality degradation.